About 100 buses are trundling around Brisbane with a subtle but very real typo gracing the "No smoking" signs placed inside. The misspelling was picked up by Reddit user Nacrimo, who titled his masterpiece: "Every. Single. Brisbane. Bus. How have I not noticed this?" In Nacrimo's defence, it is easily missed; luckily, he's zoomed in on the offending error. According to the Courier Mail, not every bus in Brisbane is affected by the slip-up, with one council spokesman estimating about "eight per cent of Brisbane's 1,200-plus bus fleet" carry the offending sign. 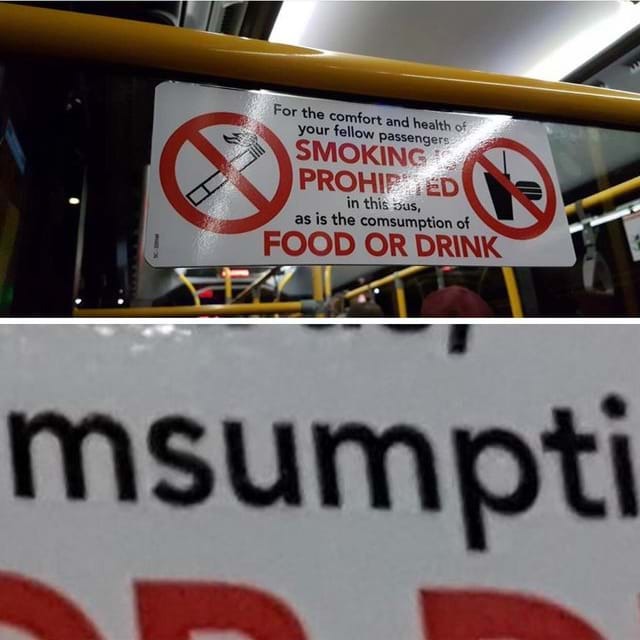 "Council is aware of a misspelled word on an information sticker displayed on some Brisbane buses," they said. "An audit is underway and Council will ensure all stickers identified with a misspelled word are replaced as soon as possible."